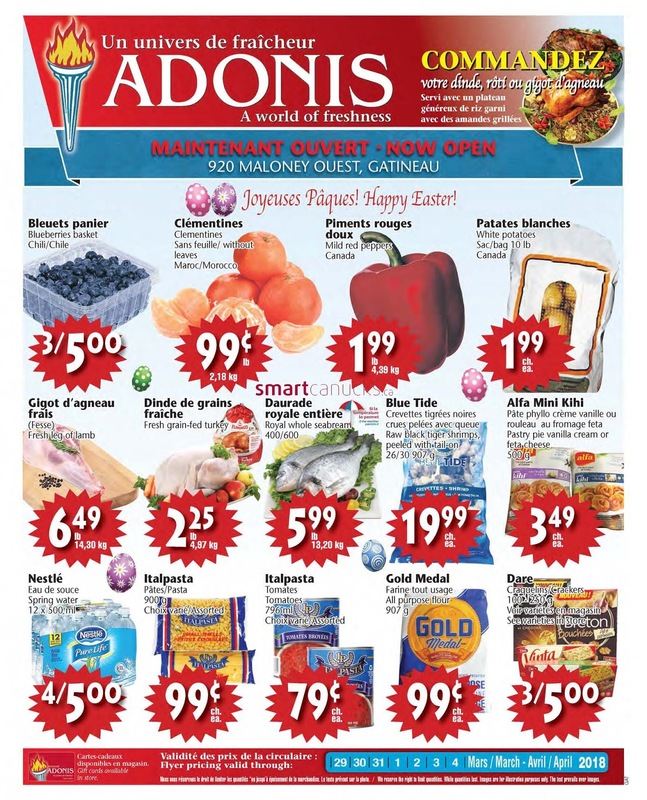 Marche Adonis Canada Flyer March 29 - April 4, 2018 - Blueberry Basket Product of Chili 3/5.00. Clementines Without Leaves Product oP Morocco Product .99 lb /2.18 kg. Mild Red Pepper Product of Canada. 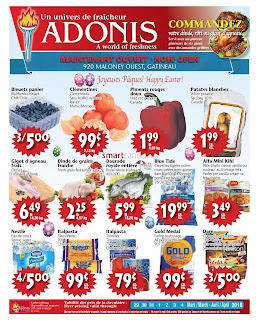 Marche Adonis Canada Flyer Potato Bag Product of Canada 10 lb 1.99 ea. Imported Leg of Lamb 5.99 per lb 13.21 kg. Royal Seabream 400/600 5.99 per lb 13.20 kg. BLUE TIDE Black Tiger Raw Shrimp Peeled Tall On 26 / 30 907 gr 10.99 ea. 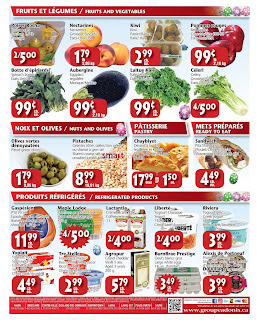 RIVIERA Yogourt Grec assorted 500 gr 3.99 ea. 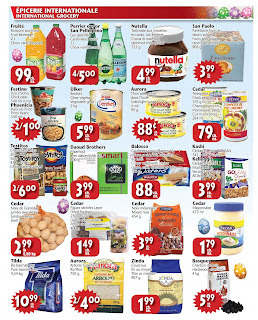 YOPLAIT Yogurt Source or Creamy assorted 16 X 100 gr 4.49 ea. THE STELLE Cheese Bocconcini 200 gr or Ricotta assorted 475 gr 2.99 ea. AGROPUR Grand Cheddar Cheese Aged 5 yrs 200 g 5.79 ea. BURNBRAE Large White Eggs 18 un 3.49 ea. DU VILLAGE Sir Laurier 170 gr Lady Laurier 150 gr or La Tentation 125 gr. FRUITE Beverage assorted 2 ltr .99 ea. PERRIER or SAN PELLEGRINO Carbonated Water assorted I ltr 4/5.00. NUTELLA Cocoa & Hazelnut SAN PAOLO Fruit & Sultana with Skimmed Milk Spread Raisin Panettone. PHOENICIA Pinto Beans 54O ml Or FESTINO Chick Peas sau 540 ml 2 /1.00. ULKER Bereket Vegetable Ghee 2 kg 5.99 ea. TOSTITOS Chips or Sauce assorted 205 - 275 gr 2/6.00. 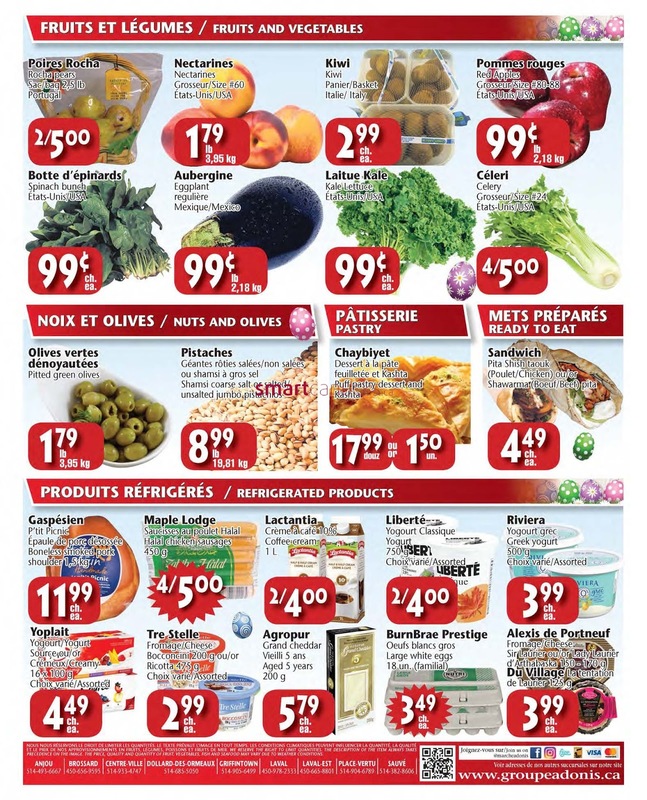 CEDAR Chick Pea Dip 370 gr or Cut Mushrooms 284 ml .79 ea. 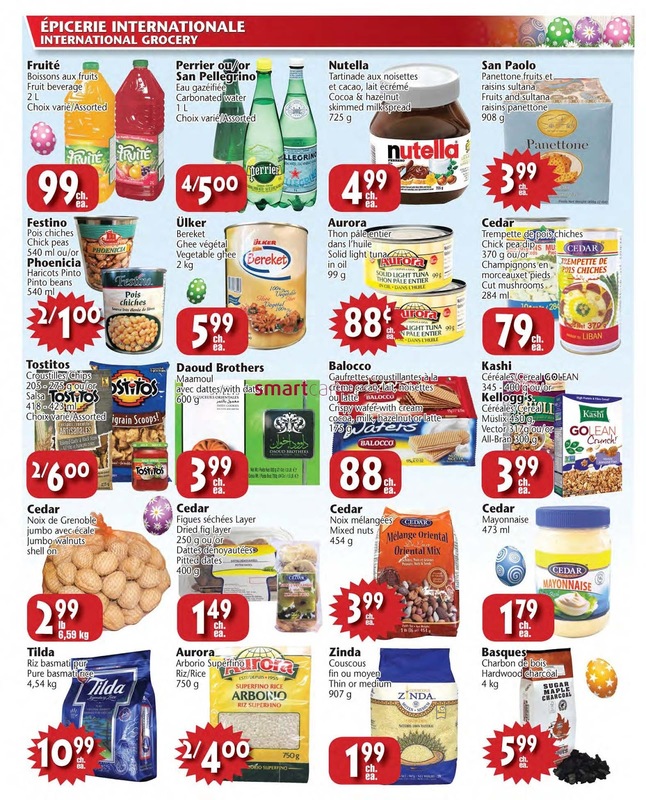 DAOUD BROTHERS Maamoul with Dates 600 gr 3.99 ea.